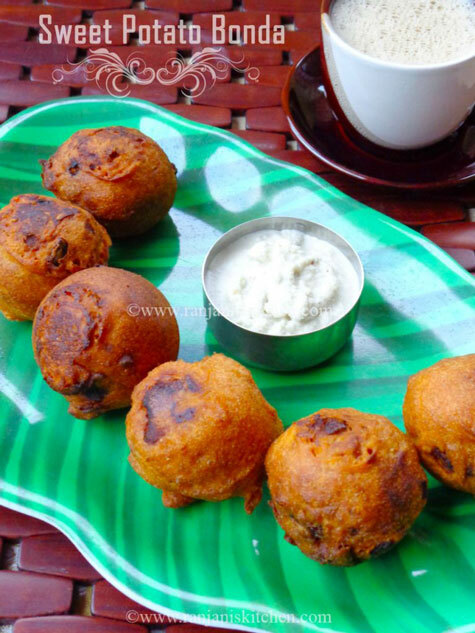 Sweet Potato Bonda / Snacks recipes – Home made snacks are always enjoyable and heart filling one. If it is with seasonal ingredients, the joy will become double. Yes, it’s a season for sweet potato. I am looking out for the recipes to try using sakkaravalli kizhanghu (sweet potato). However, I can eat simply after a steam cook with salt. That is how I brought up. Still, I remember, mom keeps this steamed kizhanghu hot for winter evenings. After returning from school, I used to eat this. Sometimes three to four pieces will go in includes my Lil sissy and bro part. I never tasted any different recipes with sweet potato. But wanted to try some. Bonda is always hit at any home. Then why not with sweet potato? So I tried, I really loved the outcome. The bonda is delectable and fulfilled my palate with little sweetness of kizhangu. I promise, you all will enjoy this Bonda for sure. For these two days, I don’t believe am in Chennai or somewhere like hill stations. The weather is really enjoyable to chill at home. But don’t know I can take this happiness fully. This rain causes big vandalize on slum areas and for the people who live on road sides.So rain god! This is adequate now. We want your gaze in summer to boost up Chennai. Wash sweet potatoes, pressure cook with enough water and salt for 4 to 5 whistles. After the pressure releases, take the potatoes from cooker and cool down, peel off the outer skin and mash the potatoes. Keep it aside. To prepare the masala, chop onions, green chili, ginger and garlic very thinly. Heat a kadai,pour oil, once heated ,add onions,garlic,green chili and ginger.Sauté well for 2 mins. Add the spice powders, red chili powder, coriander powder, cumin seeds powder, garam masala and salt. Stir for 1 min in medium heat. Now add mashed potato to that mix. Keep in low flame and stir to blend the masala and potato. Switch off the flame, allow this mixture to cool completely before making the balls. In this meantime, prepare Bonda batter. In a wide bowl, add ¾ cup or a level which needed, pour water little by little and mix with a whisk. The batter consistency should be like semi thick that neither too thick nor too thin.As I used instant bonda mix, so no need to add salt, chili powder and all. For the softness I added a generous pinch of cooking soda. But it’s purely optional. Prepare the batter and keep it aside. Now make medium sized balls using the stuff we prepared.Arrange it in a plate to coat and fry. Heat a wok, add enough oil to deep fry bonda’s. Once the oil heated, keep the flame medium, dip one ball in the batter and coat with batter fully using hand or spoon.Leave the extra drops in hand to the bowl and slowly place it in oil. Let it fry for some time and flip on other side. Fry golden brown equally on both sides, drain the oil and place it in kitchen tissue to absorb excess oil.Serve with coconut chutney or kara chutney. Instead of cooking sweet potato in pressure cooker, use idli steamer and steam cook for 10 mins. This potato will easily cook on both. Add veggies of your choice in addition like cabbage, carrot or peas. In case to prepare bonda batter rather than instant mix, refer this potato bajji to prepare batter. But make it slightly thick than bajji batter. If you need more flavorful Bonda, add curry leaves and coriander leaves. Chop them finely and add it. Leave the extra batter dropping on the sides in bowl itself to get perfect shapes. Keep the flame medium, once the oil heated. Do not heat the oil to smog level as it will burn the bonda’s. Just keep in medium flame, equally fry on both sides and enjoy.